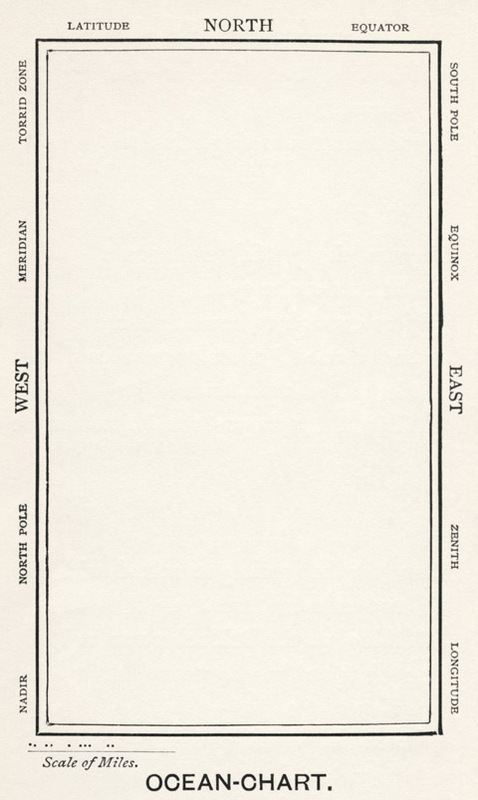 The Mirage of History presents a series of artists’ practices that share a documentary approach to explorations of the spatio-temporal unknown. The point of departure is a visionary film made by Nancy Holt and Robert Smithson in 1968, in which Smithson walks with Michael Heizer through the captivating scenery of Mono Lake in California, reading excerpts from geological textbooks as invocations of an “archaeology of the future.” In a similar way, Armando Andrade Tudela films the Marcahuasi plateau in Peru: his gaze lingers on this landscape, a place resounding with manifold stories and representations, as though it holds traces of a “cosmic antiquity”. In their attempt to locate the “islands of history” (Marshall Sahlins), these artists seek out spaces of reinvention and permanent revolution that contravene the conditions of possibility for history itself. Joachim Koester documents the remains of Aleister Crowley's Thélèma Abbey, where filmmaker Kenneth Anger and the sexologist Alfred C. Kinsey once met. Michael Stevenson retells the story of Manfred Gnädinger, alias Man—a modern Robinson Crusoe whose life was destroyed by the ecological disaster of the Prestige oil tanker spill in 2002. And Mariana Castillo Deball recounts the story of a female scientist from CERN in Geneva, interspersed with images of gems from the collection of the French writer Roger Callois. Armando Andrade Tudela, Marcahuasi. 2009, 11mins, Peru/Germany. Mariana Castillo Deball, Entropology. 2009, 8mins, Mexico. Dominique Gonzalez-Foerster, Atomic Park. 2003, 8mins. France. Daniel Gustav Cramer, Orrery. 2012, 20mins, Germany. Nancy Holt, Robert Smithson, Mono Lake. 1968-2004, 20mins, USA. Joachim Koester, Morning of the Magicians. 2005, 5mins, Denmark. Uriel Orlow, Holy Precursor. 2011, 14mins, Switzerland-Great Britain. Michael Stevenson, On How Things Behave. 2010, 16mins, New Zealand-Germany. Yann Chateigné Tytelman (b. 1977) is a critic and curator. He currently serves as Dean of the Visual Arts Department at Geneva University of Art and Design in Switzerland. He was previously the Chief Curator at CAPC Museum of Contemporary Art in Bordeaux. His recent projects include Seismology (Palais de Tokyo, Paris, 2012), The Curtain of Dreams: Hypnagogic Visions (IAC Villeurbanne, 2011-12), and Explorations in French Psychedelia (CAPC Museum of Contemporary Art, Bordeaux, 2008-09). Presented in collaboration with Geneva University of Art and Design, and the Western Front. 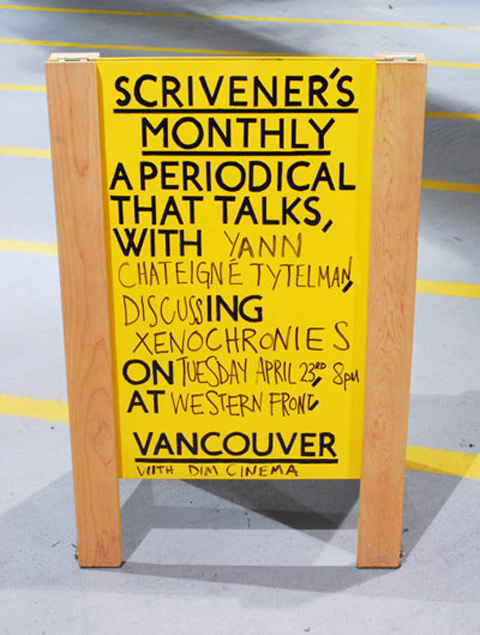 Scrivener's Monthly is pleased to present Yann Chateigné Tytelman discussing Xenochronies on Tuesday April 23rd at 8pm in the Grand Luxe Hall at the Western Front. Xenochrony, a word that derives from the Greek xenos, strange or alien, and chronos, time, is a studio-based musical technique developed in the early 1960s by composer Frank Zappa. Xenochrony is executed by extracting a guitar solo or other musical part from its original context and placing it into a completely different song. “The musical result”, says Zappa, “is the one of two musicians, who were never in the same room at the same time, playing at two different rates in two different moods for two different purposes, when blended together, yielding a third result which is musical and synchronizes in a strange way”. Starting from here, we will explore a series of artists works who, luminously, use similar techniques of montage and adventurous dislocation to produce a specific form of knowledge. To be evoked: the writing of history “in between science and fiction”, fables, "adventurous coherences" and documentary fictions, dust breeding, fictocriticism and “the dispersed science”.